If one were to dole out stars to rate the Pi’s recently completed Mac Masters Seminar, the number I would assign would be 4 out of 5! The Spectrum Theater was great, the speaker top notch, the accommodations and services just dandy; even our event planner and assistant did a superb job. So, why not five stars? There was one thing missing: You! Two perspective drawings of the Mac Masters seminar by Laura-Leigh Palmer, from her sketchbook. Attendance for the event was disappointing and we are deliberating as to why. While the initial reposts from those attending have been very favorable, and this might help promote the next such event, it does little to assuage the fact that we just didn’t fill a majority of the 350 seats available. We felt we promoted the event in a timely and thorough manner via paid advertising, online promotion, written communications and even event flyers distributed to some local computer retailers. But alas, we brought in very few people from outside the Pi. We plan to survey those in attendance, and those who expressed interest in this type of event, to learn individual’s rationale for attending and not attending. Oh, and if you are in neither aforementioned category but have a comment you want to pass along about the event, just shoot off an email to office@wap.org. We hope we can learn from all this and the next time we will see a SRO (Standing Room Only) crowd. 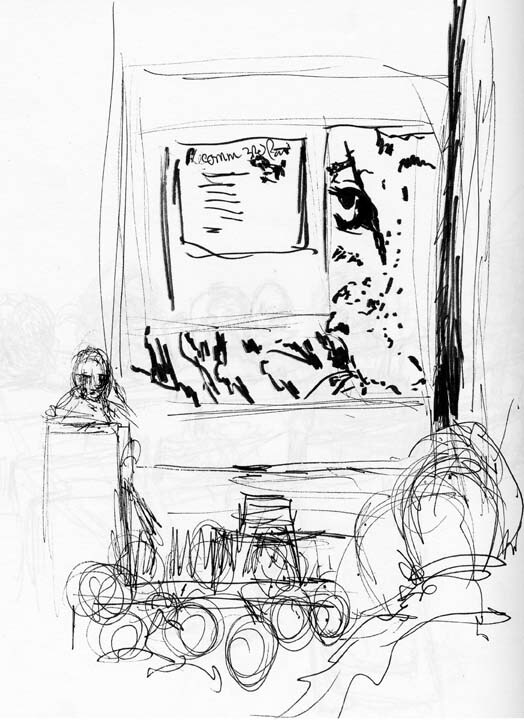 Mac Masters screen and speaker, drawing by Laura-Leigh Palmer. But enough of the gloom part. What happened? Bob LeVitus, a.k.a. “Dr. Mac,” gave the crowd an excellent presentation on Mac OS X Leopard and Living the iLife, which covered some great tips and uses of Apple’s iLife 08 applications. Bob enlightened and entertained! His presentation style, as well as his dress (shorts and sandals on the second day), was totally informal, and he enthusiastically entertained questions throughout both presentations. During each break and at lunch, he was bombarded with more inquiries and he responded with authority and aplomb. Bob is a good presenter who is totally approachable and a pleasure to work with. Thanks, Dr. Mac! And to those who joined us on a warm Friday and stormy Saturday, was it worth it? I propose we let them speak for themselves, and we will pass along those comments along with other pertinent details in an expanded article about the event in the next Journal. The survey responses should speak volumes and you should hear what folks had to say, so stay tuned for the final report coming in the next Journal. 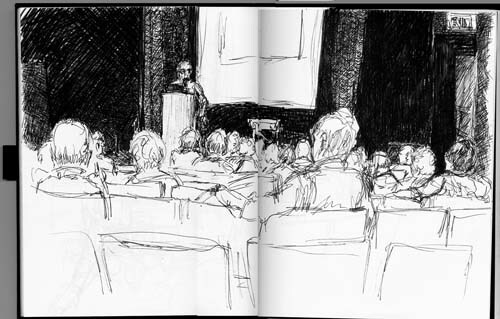 Mac Masters seminar auditorium, drawing by Laura-Leigh Palmer, from her sketchbook. To all of you who attended, we say: Thank You! We appreciate your avid support of our Washington Apple Pi.